Emily Dickinson by Scott Prior. Pen, ink, and ink wash, 1976. Jones Library. Emily Dickinson, one of the world's foremost poets, was so much a part of her community that she sometimes signed her letters "Amherst." Born on December 10, 1830, the daughter of Edward and Emily Norcross Dickinson, the poet was educated at local schools, including Amherst Academy. While much is made of Dickinson's reclusive nature, she did spend a year at Mount Holyoke Female Seminary, traveled to Washington, D.C., and stayed several months near Boston for health reasons. Though she wrote many letters, notes, and poems to her friends and neighbors, very few were published during her lifetime and all were published anonymously. Ten poems and one letter published during Dickinson's lifetime have thus far been identified; some of the poems were printed in more than one source at different times and places. It was only after her death on May 15, 1886 that Emily Dickinson became widely known as a poet. The first edition of Dickinson's poems was published in 1890 after being selected, organized, and heavily edited by Mabel Loomis Todd and Thomas Wentworth Higginson. Together they not only regularized the punctuation and capitalization, they also reworded many of her poems in order to make them more accessible to 19th-century readers. With the first volume of Dickinson's poetry well received, Todd and Higginson continued to edit and publish her manuscript poems and letters, releasing three series of poems and two volumes of letters. It was not until 1955, however, that anything resembling the text as it appears in the manuscripts was introduced to the public when Thomas H. Johnson published his three volumes of Dickinson's poems. Attempting to restore the original punctuation and grammar, this new edition formed the basis for future Dickinson scholarship. 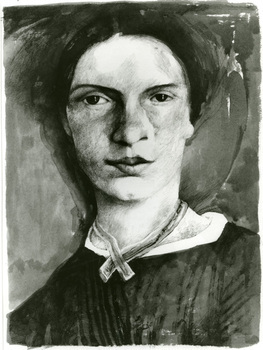 Learn more about the Jones Library's Emily Dickinson collection by viewing the collection guide.